No official name here, not even a *real* recipe, just a framework for you. We fell in love with kale salads a few years ago. And I was actually surprised that my husband went for it the first time I made one! I almost always have a bag of Trader Joe’s curly kale in the frig – it lasts quite a while and is pre-prepped (torn and washed) so this salad is easily thrown together. I also always have a ripe avocado – they’re either ripening on the counter or there are ripe ones *on hold* in the frig. This salad frequently accompanies our other “go-to” meal item, our homemade frozen tamales, as the flavors are complementary. 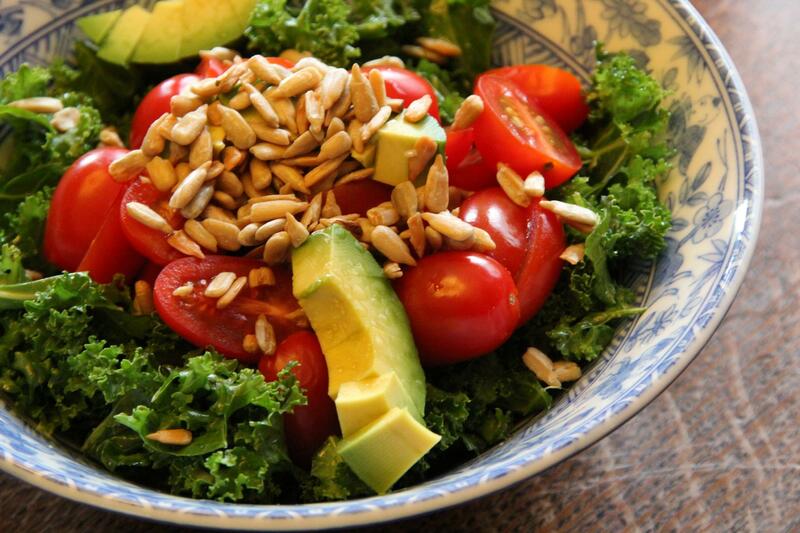 Place your kale in a bowl and drizzle with a bit of olive oil and a dash of salt. Massage kale with your hands until the leaves are coated. Sprinkle with garlic powder and let it rest while you make the other parts of your meal; the leaves will soften. Top kale with remaining ingredients and serve. Still feeling like you indulged too much over the recent holiday? 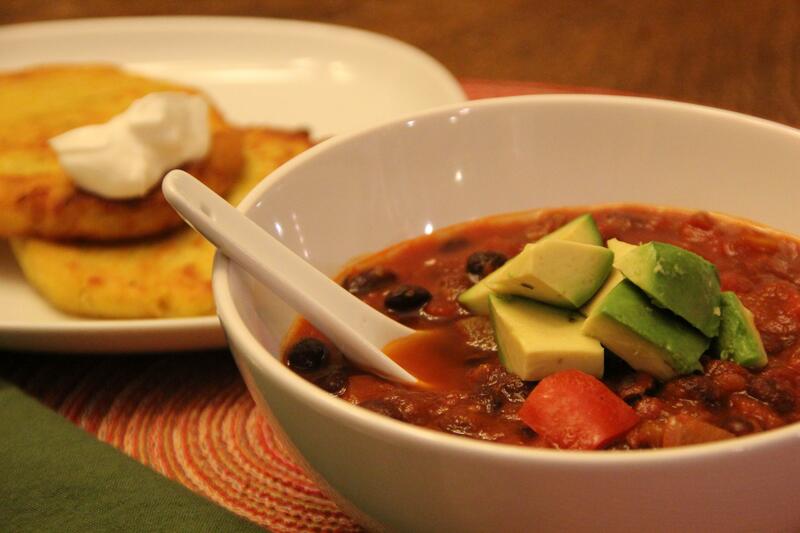 Here’s a healthy, hearty chili to offset some of those feelings of guilt. Heat 1 Tbsp or so of olive oil in a large soup pot. When hot, add onion and saute for about 3 minutes. Add bell pepper and saute until crisp-tender, about 3 minutes. Add garlic and saute for one additional minute. Stir in chili powder, cumin and oregano and cook for 1 minute, stirring frequently so that spices do not burn. Stir in diced tomatoes and sauce. Add broth and squash. Simmer for 10-15 minutes or until squash is tender (when pierced easily with a fork). Stir in beans and chipotle puree. Add more broth if needed, to get to desired consistency. Simmer for 10 minutes more or until beans are heated through. Stir in salt to taste. Serve topped with chopped avocado, cheese, green onions or sour cream. * This time I used pre-cut butternut squash from Trader Joe’s and I pre-cooked it for a few minutes in the microwave. * Use any variety of beans. I used black beans, pinto beans and kidney beans. * Be sure to check the label of your chipotle peppers in adobo, not all brands are gluten free. When I open a new can of chipotle peppers in adobo sauce, I throw the contents of the whole can in the blender and blend it into a puree. I store the remainder in the freezer to use later. 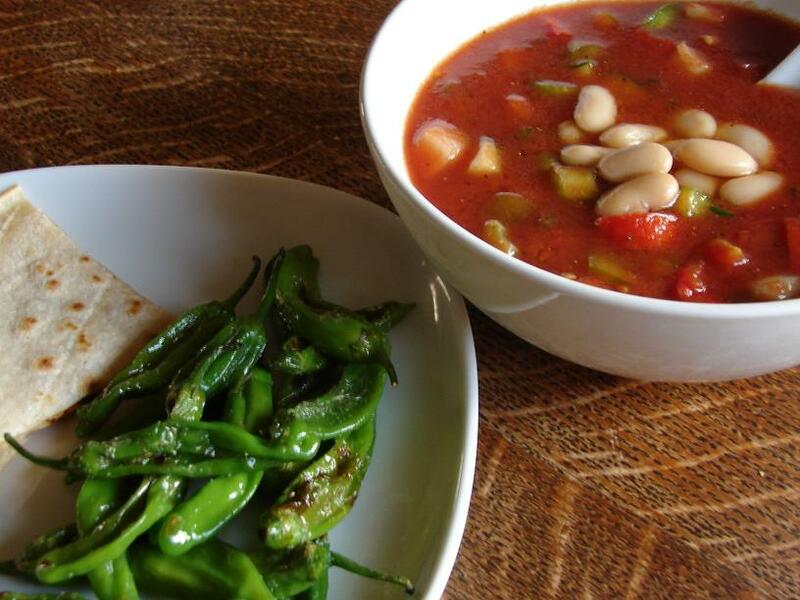 I realized the other day that we hadn’t had one of our favorite summer favorites yet – gazpacho! I realized this when I saw the growing pile of tomatoes on the counter and a couple of cucumbers in the crisper drawer, waiting to be used. We also had the last of the shishito peppers from last week’s visit to the farmer’s market to eat up. This recipe is based upon one that my mom made growing up so I am not sure where her recipe originally came from. I have changed it up a little to fit our tastes and needs but it is still very simple and tasty. Add and subtract as you desire. A few items to note – when dining out, gazpacho is usually not gluten free as it often contains breadcrumbs. Some recipes call for tarragon vinegar too, which is often made with malt vinegar – a no-no for celiacs. Check your labels. Also, chop all of your vegetables into similar sizes; we prefer a 1/4-1/2″ dice. And one last thing – this tastes better the next day, so make it ahead so that it can chill and the flavors meld. This week we served it up with some shishito peppers and quick cheese quesadillas which were just corn tortillas with some shredded cheddar between and fried in a little oil on the stove. Pour vegetable juice into a large bowl. Add remaining ingredients. Stir well. Chill for 4 hours and serve soup chilled. * Lea and Perrins worcestershire sauce is gluten free but not vegetarian, as it contains anchovies. The Wizards makes a vegan, gluten free worcestershire sauce, or you could make your own. Otherwise, substitute with gluten free soy sauce and adjust your salt as the soy sauce is probably saltier than the worcestershire. 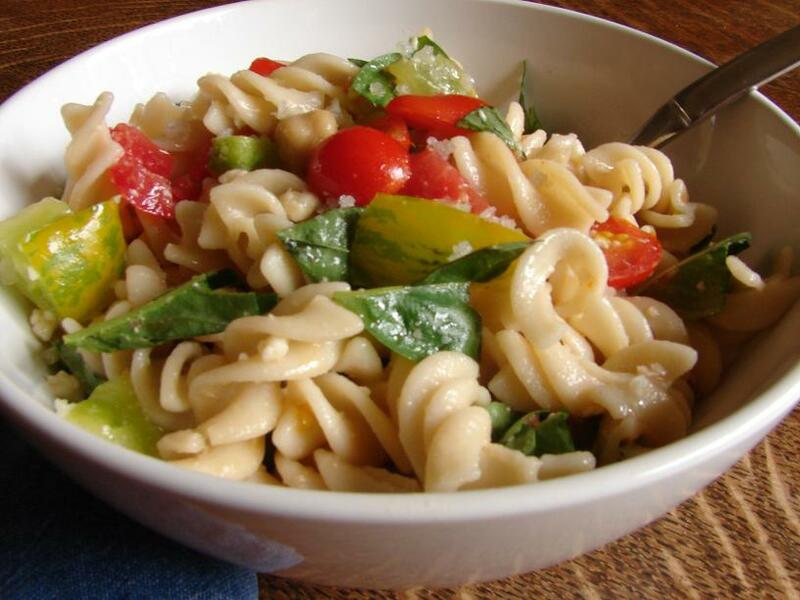 *If we are eating this as a meal, I will often add a can of white beans for protein. We have also added fresh sliced-off-the-cob corn. If you can find them at your market, be sure to grab them while they’re still around. They run about $8 per pound at the Santa Fe Farmer’s Market, but a full pound is enough for the two of us for three or four meals as an appetizer. Here is our favorite way to serve them up, from Deborah Madison, cookbook author. I use canola oil instead of olive oil as she suggests. 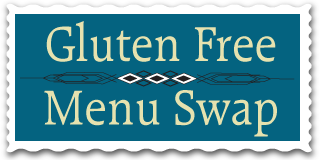 This week’s host for the Gluten Free Menu Swap is My Gluten Free Home. Her theme is apples, and she recently posted an apple dip recipe. While the apples are just starting to come in at the farmer’s markets around here, I still have end of summer vegetables on my mind, like tomatoes and sweet corn. For once, I am being overrun with tomatillos and now that the nights are getting cooler, grape tomatoes. And my kale is going gang-busters with the cooler weather again. 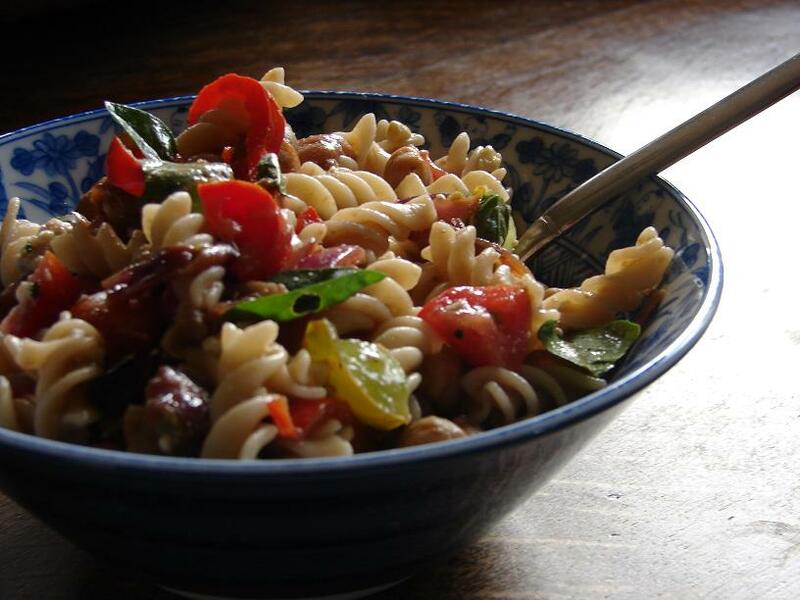 Creamy Pesto Pasta with Chunky Tomato Salsa – one of our hands-down favorite meals. And we have plenty of tomatoes still. Kale with Sun-Dried Tomatoes and Garbanzo Beans over Polenta – to try and make a dent in the kale. Red Beans and Rice – a pantry basics recipe with limited produce, good for the end of the week. I’ll probably serve it up with a massaged kale salad with cherry tomatoes (two birds with one stone!). Make You Own Pizza – hubby will probably eat a gluten-full pizza and I will use a frozen Udi’s crust. I had a craving the other day. Yes, I know it’s January and I should be eating soup all the time. 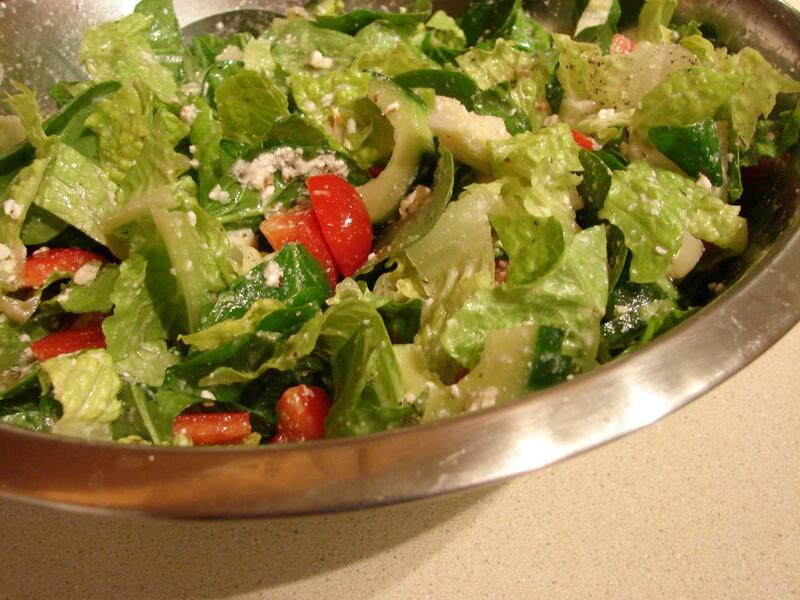 But no, we get cravings for fresh vegetables around here, and especially for a great big salad. Plus I had a couple of artichoke hearts hanging out in the refrigerator, leftover from making the Quinoa Salad. And apparently the same mix of flavors was calling out to me. So, I whipped up one of my mom’s recipes that I have made my own over the years. It hit the spot. Recipe by Renee, inspired by her mom! Mix all ingredients, yes, including the feta, in a large measuring cup. Squish up the feta with a fork until it is all mixed well. Toss salad ingredients together. Pour dressing over and toss again. Best if eaten the same day. Or keep the dressing and salad separate like I did for lunch today and mix together when ready to eat. Also, add whatever other vegetables you have on hand. Or herbs, I like to add dill weed. 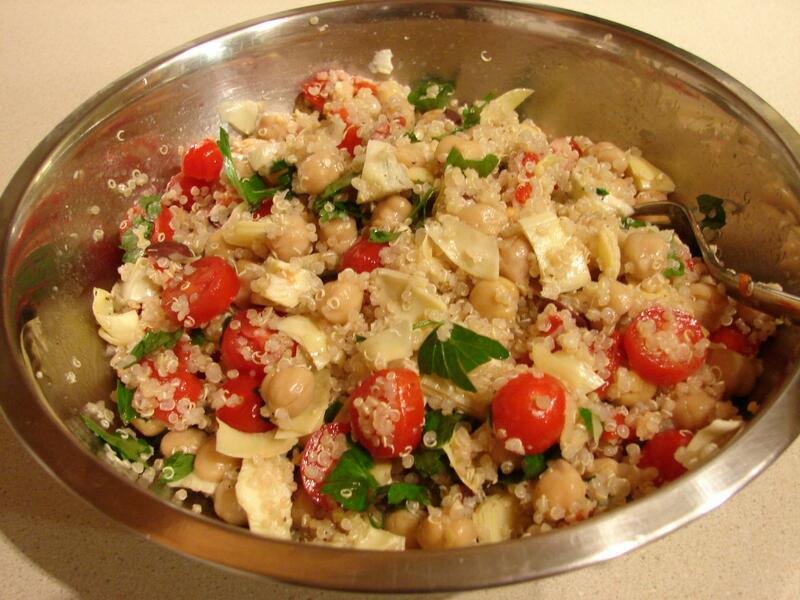 To make it a main dish, add some chickpeas or white beans. Or gluten free croutons, if you so desire. This post is linked to Real Food Weekly at The WHOLE Gang. Go check it out for more inspiring recipes!